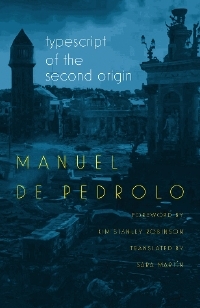 We've covered the film adaptation of Manuel de Pedrolo’s widely acclaimed post-apocalyptic novel, "Typescript of the Second Origin" many times in the past, but one of the issues with the book is that it was never available in English. Well, it seems that's changed. Wesleyan University Press have published the first English translation of the Catalan science fiction masterpiece and it's available in paperback and hardcover. The publication of the post-apocalyptic novel, which includes a foreword by Kim Stanley Robinson, tells the story of two children who survive the brutal destruction of Earth by alien explorers. The protagonists, Alba and Dídac, retreat to the forest, then journey to the rubble of Barcelona to rescue and preserve the remnants of human civilization in the city’s bombed libraries and cultural institutions. In the absence of the rule of law and social norms, the children create a utopian world of two that honors knowledge and interracial love, to become a new Adam and Eve and try to bring about the world’s second origin. A bestseller and required reading for secondary school students in Catalonia, "Typescript of the Second Origin" is indispensable to understand how a region of Spain whose language, culture, and institutions were targeted and punished by Francisco Franco. At the same time, Pedrolo’s tale of survival reaches beyond national and cultural borders to offer contemporary international readers a timely warning about the threat of global ecological destruction. Thanks to QE reader zombieja for letting us know about this wonderful development in the world of PA literature. For anyone interested in the film, it does not have any distribution and has only seen a limited run in Spain. Oh great, thanks for the write-up on this, Christopher! I'm glad someone did actually see my comment. My copy delivers today...I've been waiting 9 years for an English translation after first seeing this book and the movie mentioned here on QE in 2009.